Microsoft has been making a bunch of changes lately with the death of Points, plus Games for Windows Live and Zune Marketplace both in the trash heap. Now it looks like the name "Xbox Live Marketplace" has been replaced with simply "Xbox Games." 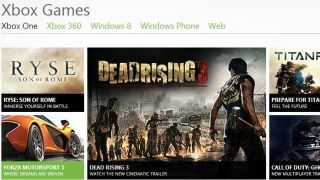 Originally a place for Xbox 360 games, the link now takes you to an Xbox One centered page with One games and info on the next-gen console. The change makes sense since the console launch is fast approaching right before, or after its competition the PlayStation 4 (which is slated for a Nov.15 U.S. release and Nov. 29 European release). Our little blips haven't changed a bit so keep on readin' away.